Friday 29th to Sunday 31st March 2019 10.15am to 5.45pm. Fully certified. Early-bird booking £345 available up to the 2 weeks before, after that £395. Payment plans may be requested but cannot be guaranteed. This course is your introduction to the world of Theta Healing®. On this exciting 3-day course, you learn the basic techniques of Theta Healing®. 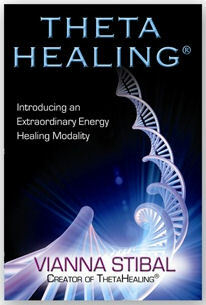 You gain insight into the science behind the technique and learn the fundamental principles of Theta Healing®. You learn how to identify and release limiting and disempowering beliefs from the subconscious mind and replace them with empowering ones for yourselves and others. The course is 75% hands on, so you leave knowing how to use the ThetaHealing® technique for yourself and others immediately. The course fee includes: your course manual and your copy of Vianna Stibal's book "Theta Healing". It is recommended that you read the book before coming on the course, (we can send it to you in advance). Upon successful completion, you are certified as a Basic Theta Healing® Practitioner. Email or use the Schedule Appointment form for course dates and more information. Payment plans may be requested. coming again soon! You can email me if you have a group or a centre that would like me to come and teach you, UK or abroad. I have set up a Facebook Page - a safe place to request swaps and practice called "BELIEF WORK SWAP GROUP (no advertising)" for students and practitioners working with belief changes. You may send a request to join, as it is not a public group. Course fees are normally non-refundable with 15 days of course commencement.